The Harris's antelope squirrel (Ammospermophilus harrisii) is gray in color with some brown on its upper front and back legs. It has a white stripe on its side, a white underbelly and a bushy black tail that it often carries arched over its back. Despite the hot desert weather, you will often see these squirrels dashing about in the middle of the day. They will stay out in the heat collecting food until their body reaches its maximum temperature and then they will rest in the shade until that temperature has lowered. Their tail is often held over their head like an umbrella helping to shade their bodies. 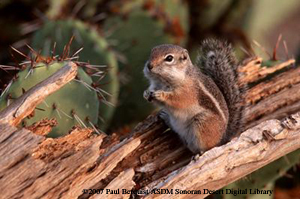 This squirrel prefers rocky desert habitats that contain cactus and shrubs. They can be found in western, central and southern Arizona and extreme southwest New Mexico and northwestern Sonora, Mexico. In Arizona, antelope squirrels are classified as non-game animals by the Arizona Game and Fish Department and are protected. They are not considered to be threatened or endangered. They feed on a variety of desert plants that range from the fruit and seeds of cactus like barrel cactus, cholla cactus and prickly pear cactus. They also will eat mesquite beans, insects and an occasional mouse. Coyotes, hawks, snakes, bobcats, and domestic cats and dogs are just a few of their predators. Harris antelope squirrels live in underground burrows that they dig under a shrub like creosote or jojoba and under mesquite and palo verde. Life span of a wild antelope squirrel is usually between 2-4 years. In captivity they have been known to live 11 years. They weigh 4.0-5.0 oz (113-150g); their body length without the tail is 8.5-10.0 inches (22-25cm), and their tail is 3.0-4.0 inches (74-94mm) in length. It is not unusual to see these squirrels in a plant such as barrel cactus eating the fruit. It is not know how they avoid the sharp spines of the cactus. These squirrels practice what is known as "heat dumping". When their body temperature reaches its upper limits they will get into a cool shady spot and lay down spread-eagle with their belly pressed against the cool ground. This releases the heat from its body to help cool the animal down.